Using a garden fence preservative will protect fence panels and posts from mould, algae and other biological threats such as insect attack. Deciding on which wood preserver is best largely comes down to colour choice and a preference between water-based or solvent-based wood preservers. Here we explain some of the key differences between the preservatives to help you make an informed choice. Which wood preservative should be used on garden fence panels? Garden fence preservatives can be easily broken down into 4 types, clear, coloured, solvent based and water based. Although there are a wide range of wood preservatives on the market that are suitable for use on fence panels and posts, they all do a similar job. 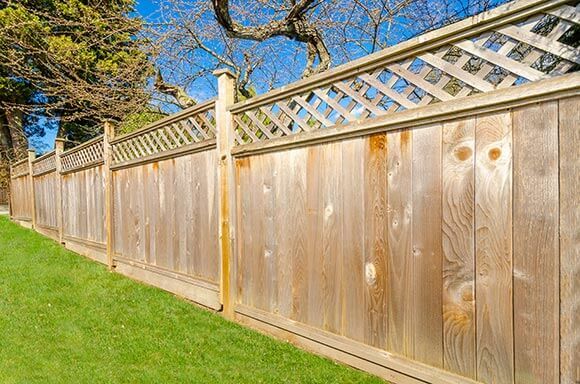 Any solvent-based wood preservative can be used on wooden fence panels meaning that it doesn’t necessarily have to be labelled as a ‘shed and fence preservative’. Solvent based preservers are generally absorbed by the fence timber better than water-based products meaning deeper penetration in to the panels and posts. Solvent-based wood preservatives are available in clear and coloured formulations from brands such as Ronseal, Cuprinol and Sadolin. Characteristics of a solvent-based wood preservers are that the liquid is very thin and has a strong, solvent odour due to the high V.O.C content. Solvent-based preservatives tend to be very thin in consistency and can splash when being poured from the tin. Coloured preservers can stain patios, concrete, stone, slabs and other surfaces so care needs to be taken when pouring. Water-based wood preservers are the modern replacement to traditional solvent-based formulations. Water-based preservers tend to be more environmentally and user friendly due to their low V.O.C content. As with solvent-based preservers, their advanced formulations provide effective treatment against mould, algae, insect attack and wood rot. Water-based wood preservers are available in both clear and coloured formulations and from a range of top name brands. Characteristics of water based wood preservers are that they tend to have a higher solids content and a low odour due to their low V.O.C content. Barrettine Premier Wood Preservative: A solvent-based wood preservative that offers microporous protection against wood rot, fungi, decay and mould. Available in clear and coloured formulations and ideal for garden fence panels and posts. Ronseal Shed and Fence Preserver: A multi-purpose coloured wood preservative, suitable for wooden fence panels and posts. Protects fence timbers against rot and decay. Eradicates woodworm and protects against wood discolouring fungi and water damage. Cuprinol Wood Preserver Clear: A clear, solvent-based wood preservative that actively protects interior and exterior wood against rot, decay and blue staining mould. Ideal for smooth and rough sawn timbers, including garden sheds, wood fence panels and posts. When applying a garden fence preservative it’s worth remembering that both solvent and water-based preservers contain fungicides and biocides to protect fence panels and posts from biological growth such as mould, mildew and algae as well as insect attack. For this reason it’s advisable to always wear old clothes, protective gloves and eye protection. Always cover and protect items and areas not to be treated, especially stone, concrete, plastic surfaces and plants and especially if applying a coloured preserver. Coloured wood preservers will easily stain these surfaces and could ruin some types of plastic. If mould, algae or fungi is already present on fence panels, it must first be treated with a mould and mildew cleaner or fungicidal wash before applying a wood preservative. Preservers are designed to help prevent biological growth but will not kill it if already present in the wood. See suitable fence cleaner products here. Although wood preservers are safe for man, plants and animals when fully dry, they are very harmful to aquatic systems and should be kept well away from garden ponds, streams, drains and other water courses. Although many (not all) wood preservatives contain a small amount of wax, they will not provide long term weather protection. To seal in the wood preserver and provide the best all-round wood protection, we recommend that garden fences treated with a fence preservative are then treated with an exterior wood oil suitable for garden fences. This will help to keep fence panels supple and nourished whilst protecting against water ingress and weathering. Some of these wood oils also contain UV filters that will help to preserve the fence colour for longer. Find further information and advice on other garden fence treatments here.